You’ll need to come back and look at this again in a minute. 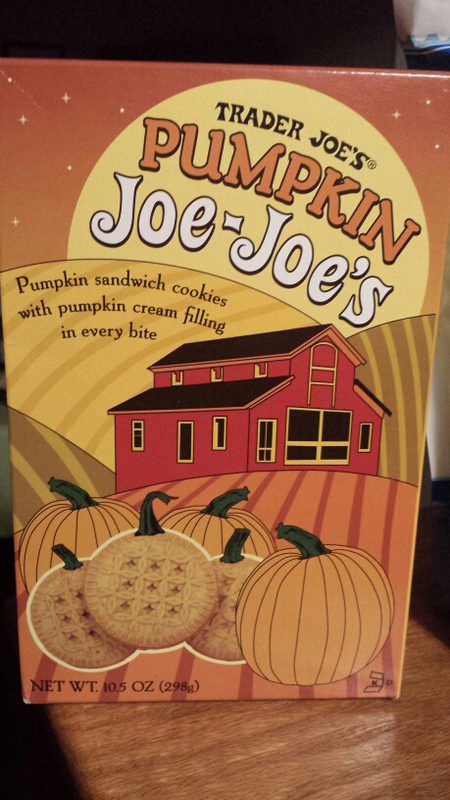 It seems high time I review Trader Joe’s Pumpkin Joe-Joe’s. 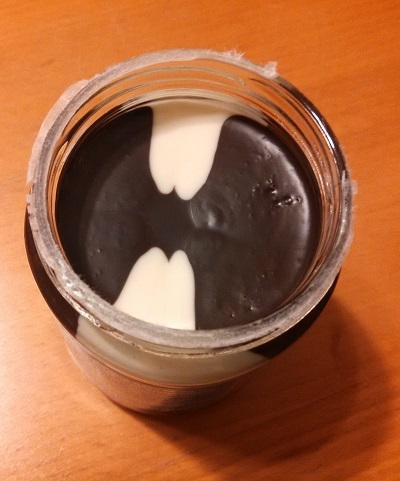 After Trader Joe’s introduced us to the Joe Joe all over again with their amazing, new Cookies and Creme Cookie Butter, it seems like the perfect time to examine the Joe-Joe itself a little more deeply. 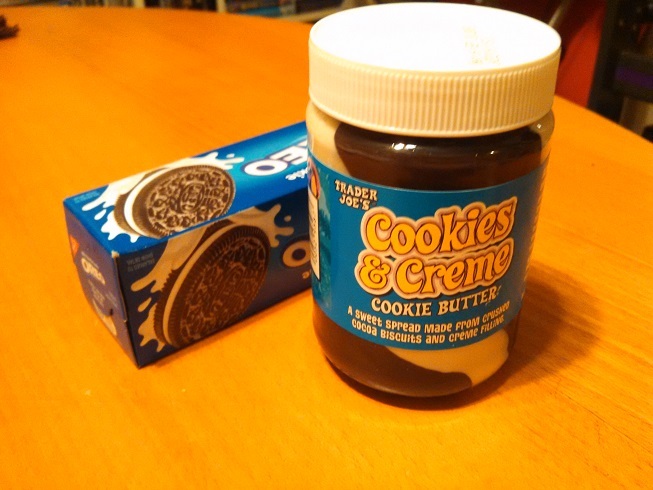 Joe-Joe’s are, simply put, the Trader Joe’s version of Oreos. Never seeing a popular product that they didn’t think they could do themselves, both cheaper and better, TJ’s has bypassed Nabisco and stocked their shelves with their own take on the iconic black and white, frosting-filled cookie. It’s these cocoa and vanilla crème cookies that have been blended down into a mind-melting emollient in the super delicious Cookie and Creme Cookie Butter, but Trader Joe’s hasn’t limited their cookie palette to just one type. Just as the Nabisco Oreo has boldly gone off in new, sometimes insane, flavor directions with their cookie (trying out such elaborate concoctions as Birthday Cake Oreos, Root Beer Float Oreos, Watermelon Oreos, and even Cookie Dough Oreos), Trader Joe’s has sought to follow suit – bringing to the table a diverse, although more limited, selection that includes Peppermint, Chocolate Creme, Vanilla Sandwich, and more. This being the time of Pumpkin Madness, Trader Joe’s has of course engineered a brand new, entirely seasonal variety – the pumpkin Joe Joe. The Pumpkin Joe-Joe is both what you’re expecting and not what you’re expecting. Based on the box art I assumed this was going to be a variation on the Vanilla Sandwich variety – vanilla cookies on the outside, with some sort of vaguely pumpkin-y icing on the inside. I, once again, was underestimating TJ’s devotion to pumpkin. While the filling is, indeed, average and pumpkin flavored so are the cookies. The whole thing, top to bottom, is one pumpkin flavored cookie ready to meet all your pumpkin-flavored cookie needs. Of course, that need for pumpkin-flavored cookies is small and fleeting, so one box of these will probably do you about right, assuming that you feel any such need at all. It’s not a bad trick, really, and if you’re planning to have people over for a harvest party or throwing a Halloween get together for your class, these will be kind of cool to have out. They’re reasonably good, but they’re not replacements for the classic variety. Will you miss them when they’re gone? No more than the Watermelon Oreo’s, I would imagine. 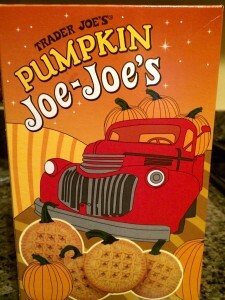 The real value of Trader Joe’s Pumpkin Joe-Joe’s, as far as I’m concerned is the box art. I believe this may provide a window into Trader Joe’s Pumpkin fevered mind. On one side of the box, we’re presented with a perspective-less landscape, irregular pumpkin shapes ominously crowding the foreground. Amongst these, three of the pumpkins have strangely “turned into” Joe-Joe cookies, still featuring their pumpkin stems and unchanged in size. Is it possible this is how Trader Joe’s fevered pumpkin-geneers see the world? Do food objects occasionally waver before their eyes, super-imposing themselves on top of pumpkins, like the vision of a starving man in a Bugs Bunny cartoon? On closer inspection, the land which the scene takes place on also appears unusual. Huge, round, orange hills with long striations extend one past another, blotting out the horizon – as if the land itself was reduced to pumpkins, the world nothing but one endless, ever-mounting series of incomprehensible pumpkins. Don’t gaze to long, lest the Pumpkin Madness claim you too! The other side of the box is much more disturbing, and exceeds my ability to fully analyze. We’re presented, jarringly, with a flattened, distended pickup truck. It too is dwarfed by the many pumpkins that crowd the image – including three massive towering pumpkins that overflow the truck itself, dwarfing it with their inexplicable size. This is to be expected from Trader Joe’s pumpkin psychosis – but the truck is not so easily understood. One headlight is blank, the other ringed by concentric circles, like two wildly staring eyes. The truck seems to almost have one of those cartoon car faces – a nose, eyes, a mouth – except twisted and disturbing. The blank eyes point directly at the viewer from the trucks “face”, its huge, broken, irregular grill spread into a wide deranged grin. It brings you the pumpkins. It brings you the huge, alien pumpkins whether you want them or not. It brings you the pumpkins, regardless of its own will, regardless of any will but the pumpkins own, driverlessly bearing down on you from the hill side. It brings you pumpkins, from the heart of madness – pumpkins, pumpkins, PUMPKINS!